Pen-and-ink drawing of Shaivate sculptures from Ravana Phadi Cave at Aihole, by an Indian draftsman, dated 1853. 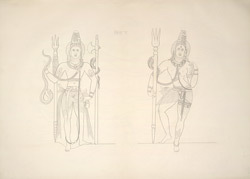 The figure to the left in this drawing represents Shiva as Dvarapala or guardian of the entrance to the shrine. This sculpture is carved on the left back wall of the hall of the Ravana Phadi Cave at Aihole, excavate at the end of the sixth century during the Chalukya period. The standing figure of Shiva rests on the right foot and holds a long trisula (trident) in the right hand. The left hand is bent and rests below the waist. He is adorned with a lot of jewellery and wears a long garnment. His posture expresses graceful dignity. The figure to the right in the drawing is Ardhanarishvara, a large sculpture situated in the verandah, on the left of the entrance of the Ravana Phadi Cave. The right half of the figure is male and the left is female as Ardhanarishvara is the combined form of Shiva and Parvati. The god is two-handed and holds the trisula in the right hand. His posture shows a rythmic movement. Aihole was one of the capitals and an important commercial centre of the Early Western Chalukya, a powerful dynasty which ruled the Deccan from the sixth century. Together with the two other capitals of Badami and Pattadakal, the site has preserved many Hindu and Jain temples which belong to a period that goes from the sixth to the 12th centuries, belonging to the Early and Late Chalukya periods and to the Rashtrakuta era.